Where better than Vienna, Freud’s hometown and a “shadowy city of ghosts,” to encounter the phantom of a friend thought dead? Holly Martins, a day away from returning to the United States, has made a shocking discovery: Harry Lime is alive, reanimated by the smirking face of Orson Welles, and apparently skulking around the doorways of Vienna, unseen yet permeating the city like an otherworldly fog. But does he haunt the city, or does the city haunt him? Maybe only in this capital of the uncanny could Holly have made such a bewildering discovery. 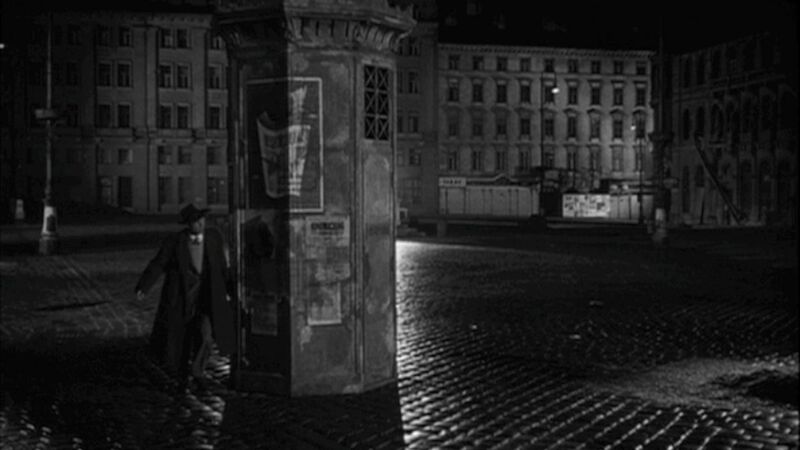 The Third Man’s vestibule and 2001’s monolith, both visually out-of-place in their surroundings, contain a wealth of secrets. Image © Warner Bros. If Vienna’s urban areas are typically conveyed to us via a distorted conflux of conflicting vanishing points and impossible angles (a transformation of real-world space that seems indebted to the bold experimentation of German Expressionism), today’s still is something else: composed of rigid vertical and horizontal lines, almost too neat in its separation of distinct geometric spaces, this image is disconcerting not because of its weirdness but because of its normalcy. It appears to be an unspectacular city plaza, so how could it give birth to undead ghosts and allow them to vanish into nothing? Like the Munich open-air plaza in Dario Argento’s Suspiria, which proves to be a stomping ground for demonic witches that turn a seeing-eye dog against his master (with gruesome results), this Viennese city square takes on an uncanny, supernatural air. The Third Man is so closely associated with Vienna (this spectacular BBC documentary about the film rightfully claims that Vienna is one of the movie’s leading stars) that we might assume the movie could have only been made in this hauntingly elegant city. In fact, though, Graham Greene originally conceived the story as taking place in either Rome or Paris; it was actually Alexander Korda, the Hungarian expat who founded London Films in 1932 and acted as The Third Man‘s British producer (in collaboration with Hollywood’s David O. Selznick), who suggested Vienna as the movie’s rightful setting. (Korda had been invited to work for Sascha-Film in Vienna in the late 1910s, by the exuberant yet controlling producer/director Alexander “Sascha” Kolowrat; in fact, it was Karl Hartl, Sascha-Film’s studio head in the late 1940s, who helped Korda arrange The Third Man‘s shooting locations and equipment usage.) The wartorn rubble of Vienna definitely offers an appropriate backdrop to The Third Man‘s intrigue (indeed, given the movie’s thematic interest in the devastating repercussions of war, such a ravaged locale seems integral in conveying the film’s darker themes), but the sad fact is that a number of postwar European cities could have offered a similarly disfigured setting. But if The Third Man wasn’t necessarily bound to Vienna from the beginning, it’s nonetheless elevated to the level of tragic poetry partially by the city’s distinct locales–Schreyvogelgasse, the Reichsbrücke bridge, the Giant Ferris Wheel in the Prater that we have yet to see–and the happy coincidence that Vienna is indeed the city of Freud. And yet, we have to wonder if modern cities themselves, rather than Vienna specifically, act as sites of uncanny, supernatural events (such as eternal recurrence, doppelgängers, and now apparently the ability to vanish into thin air). The novella that Graham Greene wrote to act as a template for The Third Man‘s script even names London as the potential site for a disconcerting miracle: “I had paid my last farewell to Harry a week ago,” the novella begins, “when his coffin was lowered into the frozen February ground, so that it was with incredulity that I saw him pass by, without a sign of recognition, amongst a host of strangers in the Strand.” Whether Holly’s reunion with his “dead” friend Harry takes place in London’s Strand or Vienna’s Schreyvogelgasse, such an impossible event seems enabled precisely by the ability for modern cities to conceal hidden forces within urban architecture and the bustling crowds that roam their streets and sidewalks. True, the majority of horror movies suggest backwoods terrain as the habitat for redneck monsters and deformed murderous families, but another strand of horror filmmaking locates terror and the uncanny in the seemingly normal trappings of modern life in the metropolis. We may think of the cat people transplanted to the modern city in Cat People (either Jacques Tourneur’s 1942 original or Paul Schrader’s 1982 remake), Roman Polanski’s loose trilogy about modern paranoia and urban alienation (Repulsion, 1965; Rosemary’s Baby, 1968; and The Tenant, 1976), George Romero’s bleak zombified social commentaries (Dawn of the Dead, 1978; and Day of the Dead, 1985, not to mention more recent installments), or J-horror standouts like Ringu (1998) and Pulse (2001) which equate modern technology and economic advancement with sinister, otherworldly forces. The country vs. city binary pops up frequently in horror films, and has been explored by numerous film theorists and critics. Christopher Sharrett, for example, in “The Horror Film in Neoconservative Culture”, suggests that horror movies began emphasizing the city (rather than the countryside) as the predominant site of horror in the 1960s and ’70s, when more progressive or critical filmmakers started challenging capitalist, patriarchal rule as the “natural” way of being for modern societies. This ideological template suggested that economically advanced cities actually concealed evil or sinister forces, exposing the underlying corruption and greed beneath modern capitalism. (Dawn of the Dead may be the clearest example of this idea.) Sharrett also suggests that such “progressive” urban horror films utilize many tropes from film noir, which actually begs a question that challenges his claim: do modern urban horror films extend further back than the 1960s to the immediate postwar years, when the genre of film noir first emerged? While I can’t think of any horror films from before 1938 that locate the modern city as the site of uncanny horror (most of the classic early horror films I can think of, from Nosferatu to The Cabinet of Dr. Caligari to Frankenstein, Dracula, White Zombie, Island of Lost Souls, and the whole Universal horror canon, posit an exotic, antiquated Other as horror itself), the possibility that such forces might exist in the modern city seems to gain some traction in such postwar noirs as Laura (1944), with its ethereal, melancholy story of fetishization and a return from death, and D.O.A. (1950), with its impending-death mystery and the nearly ubiquitous presence of evil amongst modern urban crowds. 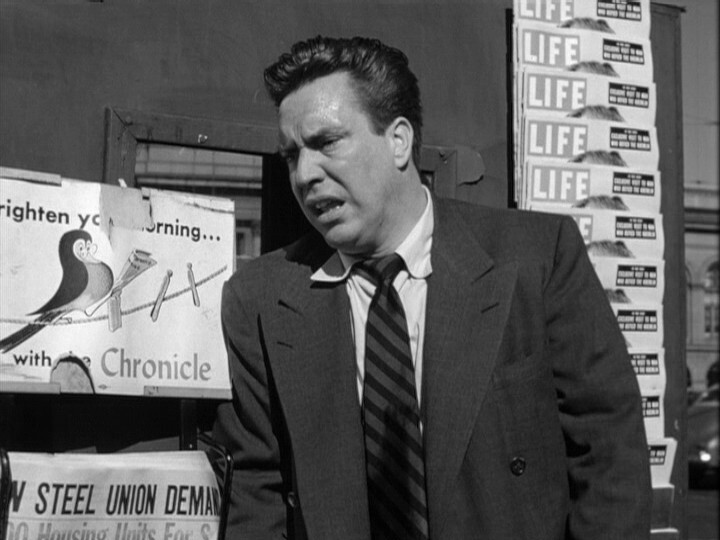 Confronting death in the modern metropolis in “D.O.A.” (1950). Image © United Artists. The Third Man is decidedly not a horror film, but at least at this point in the movie, as Holly wonders whether he’s truly seen the ghost of Harry Lime (and if he can really vanish into thin air), our beleaguered hero must be asking himself whether this phantasmic city of Vienna is really all that it seems. If postwar films noir began suggesting that modern horror festers not amongst a vilified Other but within the very trappings of modern, industrially-advanced, Western capitalist societies, then maybe The Third Man tangentially belongs to this newly-critical trend. As we’ve mentioned, the specter of war hovers over The Third Man (and, it seems, Vienna itself); given this war-ravaged city, how can modern capitalism and international diplomacy (or lack thereof) not seem vile and destructive? Suddenly stranded in an urban plaza, haunted by ghosts and perplexed by sudden disappearances, Holly is out of place in a city in which uncanny chaos reigns.